Our Police Department is a part-time force consisting of 14 officers. They patrol our roadways daily and combine with the Saratoga County Sheriff and State Police forces to meet all our community needs. The Stillwater Police also provide security for the Stillwater Town Court. The Police Station is located on Lansing Rd. next to Highway Dept. Police Commissioner Ray Cordani as First Sergeant is the commanding officer for the department. He is a 24 year veteran of the department and has assumed the position of commanding officer in 2014 after the retirement of Chief Dennis Latham. His accomplishments over many years of service, stellar performances and dedication to service will insure our Police Force will continue it’s proud traditions. Stillwater Police Dept. 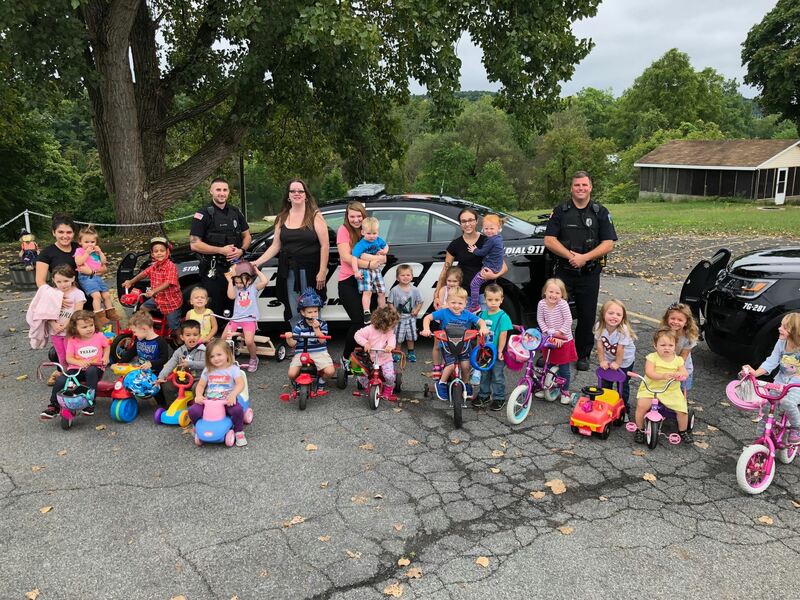 had the opportunity to meet with local children about the importance of bicycle safety. We were invited to speak to a group of pre-school aged children at a the local childcare center, Ford’s Daycare. The children were also allowed to check out the interior of the police units, which was a huge hit! The event ended with all receiving ice cream coupons as a reward for their participation. Sara Ford…you do a great job! Thank you to Officer CJ Brownell and Officer Matthew Lyons for taking time out of their busy morning! The Stillwater Police Department hosted their annual Domestic Violence Awareness press conference. The event was in timing with the month of October, which is designated as National Domestic Violence Awareness month. The goal was to shed a light on domestic violence and its devastating effect on society in general. Stillwater Police have collected over 5200 donated cell phones since 2003. These phones were handed over to advocates for distribution to victims for use in calling 911 if they find themselves in harms way by an abuser. A heartfelt thank you goes out to the Office of Senator Kathy Marchione, NYS Assemblywoman Carrie Woerner, Saratoga County District Attorney Karen Heggen, Saratoga County Sheriff Michael Zurlo, Stillwater Town Supervisor Ed Kinowski, Wellspring of Saratoga Springs, Mechanicville Area Community Services Center, DeCrescente Distributing Company, Toyota of Clifton Park, Ballston Spa National Bank (Stillwater), Wiley Brothers (Schaghticoke), Mechanicville Express Newspaper.